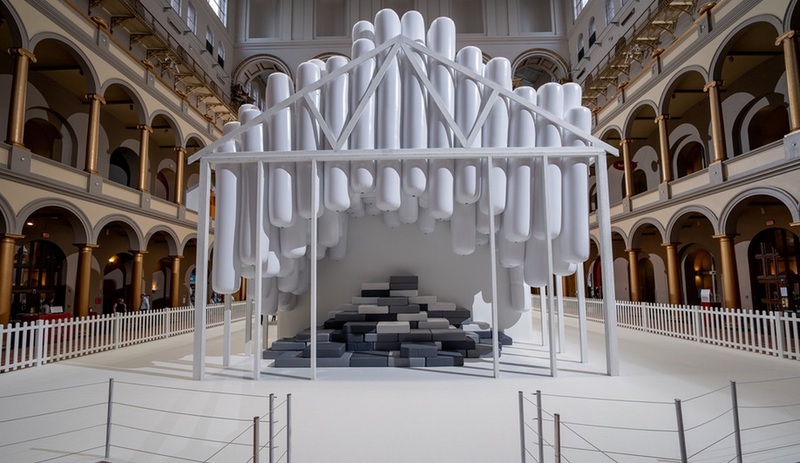 Part immersive installation, part whimsical retrospective, Snarkitecture’s Fun House is on now at the National Building Museum, in Washington, D.C. 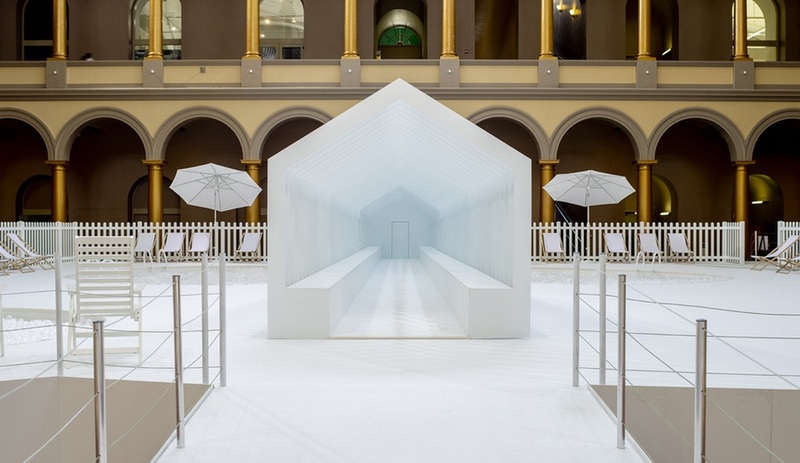 The summer installation at Washington, D.C.’s National Building Museum is always a ton of fun. 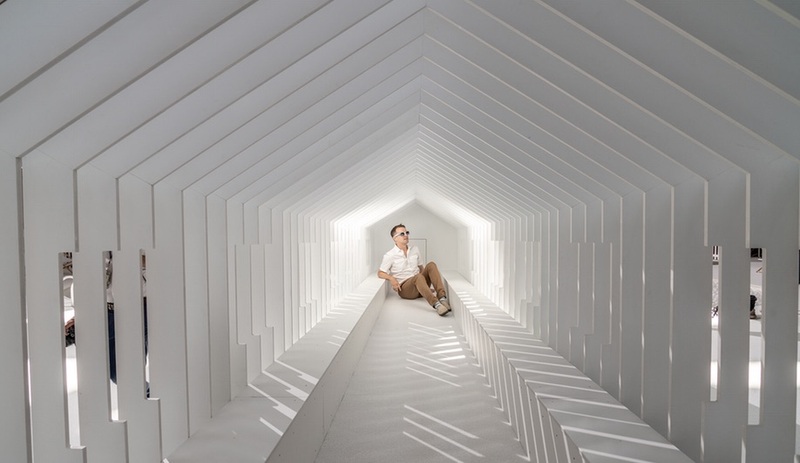 Since the inaugural Summer Block exhibition in 2014, when Bjarke Ingels installed a giant wooden maze in the building’s historic Great Hall, it’s become a highly anticipated event for locals, as well as the global architecture community who have since seen the columned space temporarily transformed by Jeanne Gang, James Corner Field Operations and Snarkitecture. 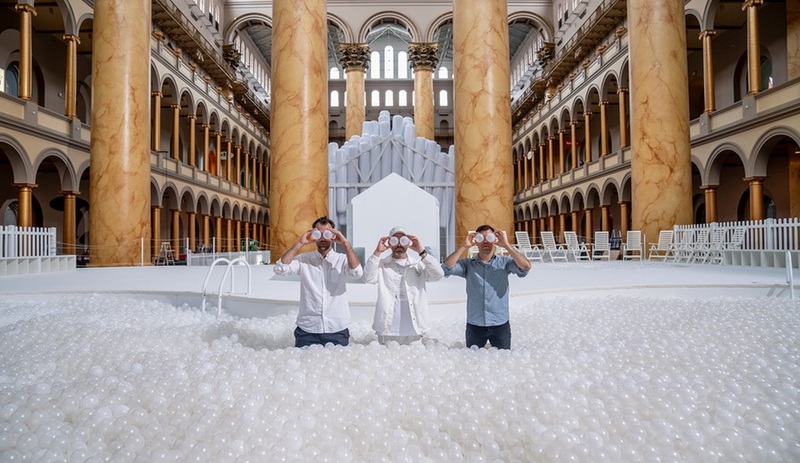 After filling the room with nearly one million clear plastic balls for 2015’s The Beach, Snarkitecture is back for an encore, with the aptly named Fun House. 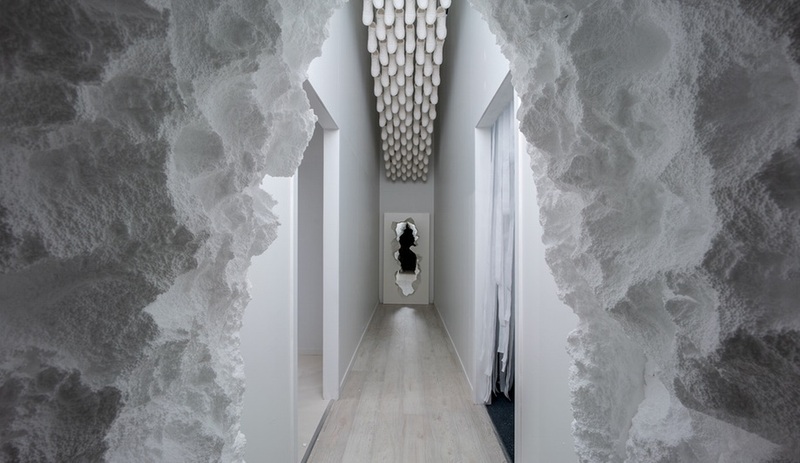 Rather than focusing on a single, massive gesture, this installation brings together 42 of Snarkitecture’s previous works, hiding a series of wonders within the layout of a traditional American home – complete with a kitchen, bathroom, attic, as well as a backyard with a pool and playhouse – all dressed in white, the studio’s signature colour. 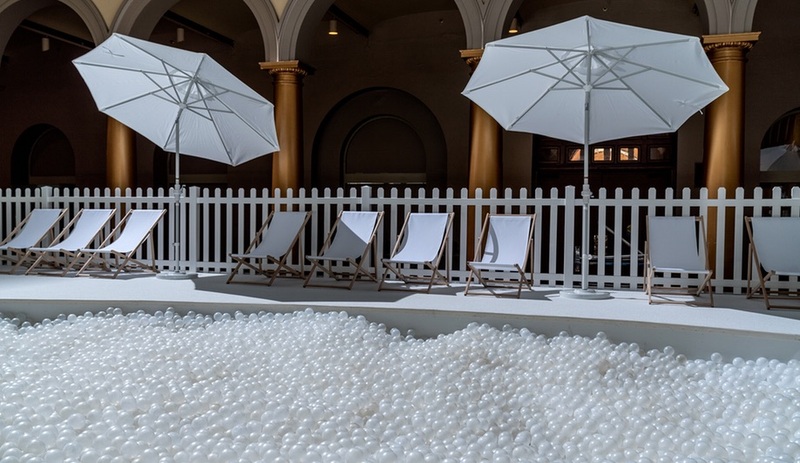 The pool, no doubt, will look familiar – a reimagining of The Beach in kidney bean form, it features the same clear plastic balls as the 2015 installation, though significantly less of them. Enclosed in (natch) a white picket fence, and lined with same outdoor chaises The Beach-goers lounged in, the backyard has yet another feature that may also create a feeling of déjà vu. 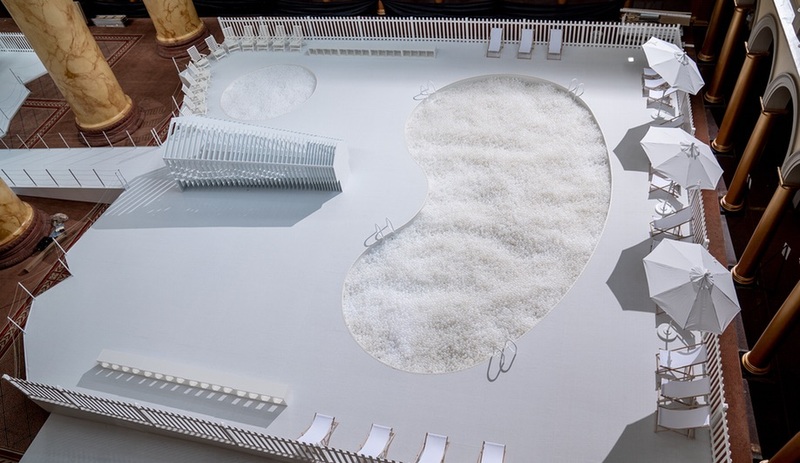 If you happened to get to Indiana to see Snarkitecture’s contribution to Exhibit Columbus last summer, you’ll recognize Playhouse perched beyond the pool. The telescoping, pitched-roof Playhouse was originally squeezed into an alleyway between two brick buildings in Columbus, a town famous for its architectural gems. The structure’s shrinking dimensions create the illusion that its depth is far greater than in reality. 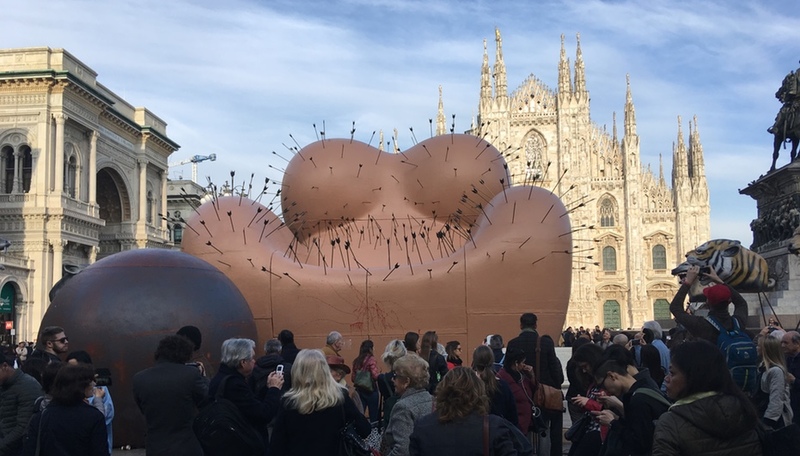 The installation becomes even more immersive within the Fun House itself. 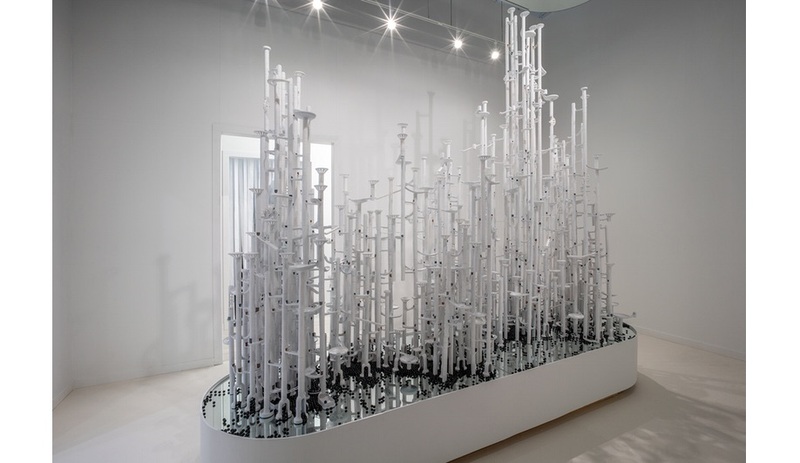 Packed with nooks, crannies and objects to explore, the house is where you will find many of Snarkitecture’s most recognizable objects, furniture pieces and artistic interventions on display. A dissolving wall that opens to the foyer is a reincarnation of the Dig exhibition originally created for NewYork’s Storefront for Art and Architecture, in 2011. In the playroom you’ll find the Marble Run shown in Miami in 2015, and in the bedroom is a recreation of the studio’s Milan installation for Cos, that same year. 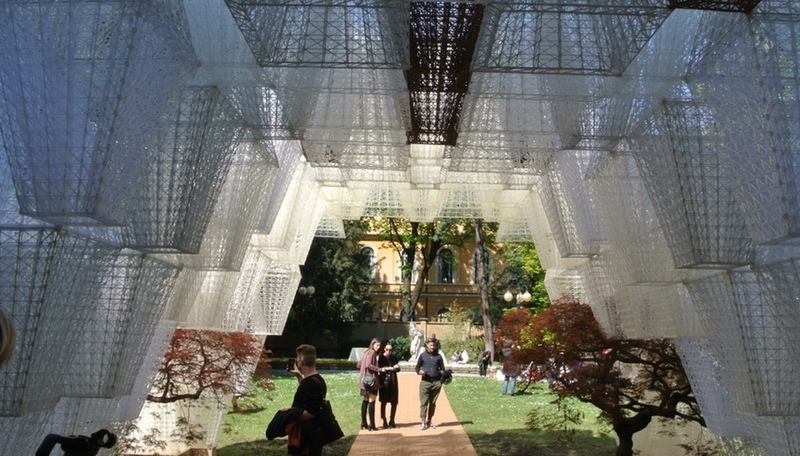 Light Cavern carved a series of spaces into a cavernous volume using 30,000 strips of perforated white fabric which hung from the ceiling in different lengths. 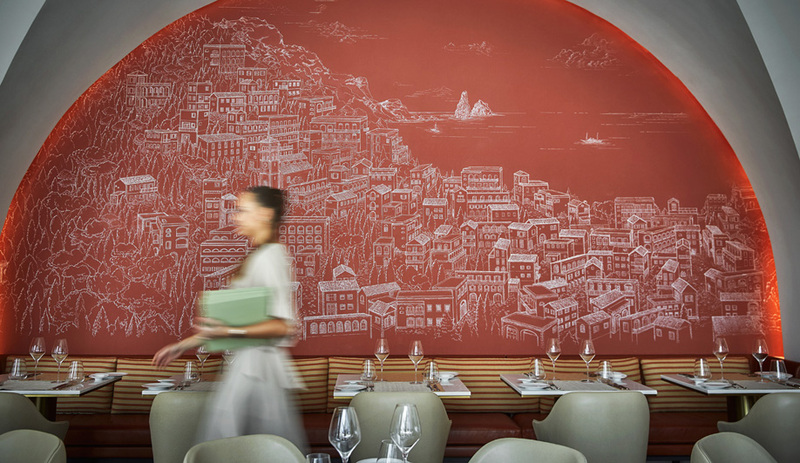 In the kitchen visitors can take in curiosities such as Snarkitecture’s colourless cast gypsum Christmas ornaments and their Beats headphones, which rest on a marble pillow. Cutaway Cabinets and Topographies wallpaper both recall the Dig exhibition with their multiple layers – both real and perceived. 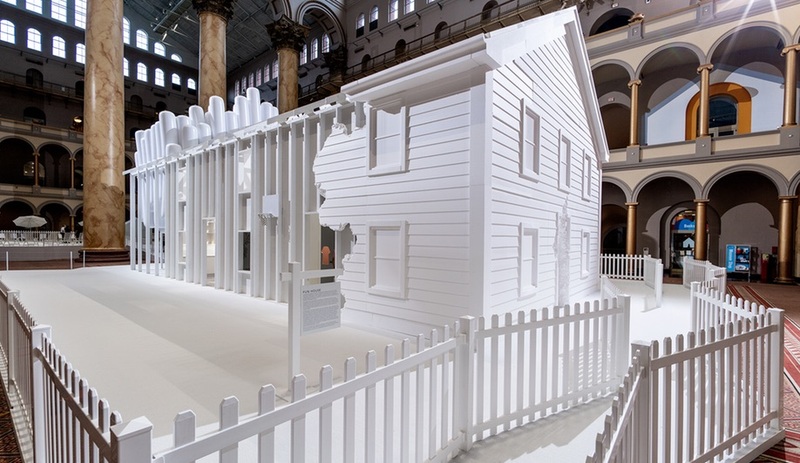 Fun House runs until September 3, at the National Building Museum, in Washington, D.C.